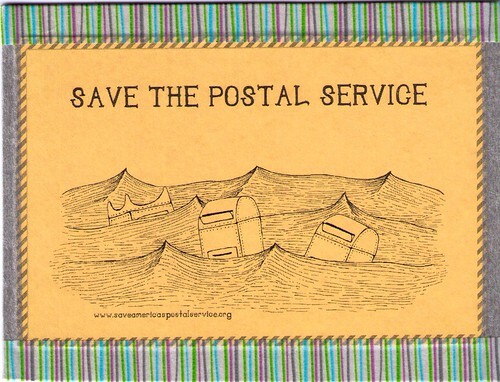 So this is one of those awesome free printable "Save America's Postal Service" postcards that I blogged about a couple of days ago. The savvy designer recommends cream card stock, but I don't have cream card stock. I do have glaring bright orange card stock! So, I printed on that, jazzed it up with some washi tape, and taped it to some paperboard, as my card stock felt a bit flimsy for the mail processing machines. It makes me smile to think of any postal worker than handles this, and notices it. I made this little doodle of appreciation on the back. 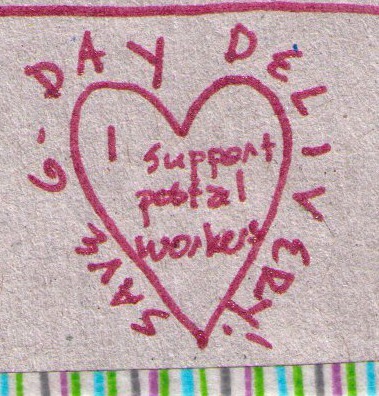 So sweet that you want to help the postal service! This card and the doodle are beautiful! I love what you did with the postcard--the washi tape was such a great idea! And I hope the postal worker notices your note! Great card and doodle. I shall send a few myself. One, at least, to my daughter in Chile. Always looking for interesting things to send along. Yes. We MUST save the post office! I love your committment to the USPS and snail mail! I couldn't agree more and do everything I can to support their efforts. 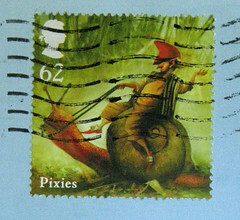 I'll make up a postcard myself just to say thanks... and thank you for your efforts! Happy 2012!! !